Over the weekend, Nasa astronaut Scott Kelly shared an image of a blooming flower that the crew of the International Space Station has managed to grow. 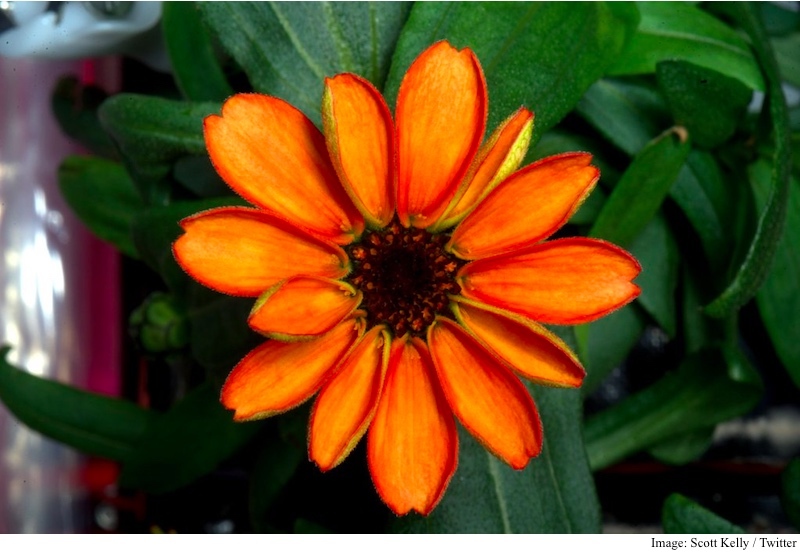 This is the first flower that has been grown in space. The space organisation announced plans to grow flowers last November. The team grew zinnia, a genus of plants of the sunflower tribe within the daisy family, late last year. In August last year, team sampled the first lettuce it had grown in space, and said it tasted “awesome.”After starting the zinnia flower project in November, Kelly noted the plants’ condition started to wither amid excessive humidity and limited air flow. Kelly said he had to channel his inner Mark Whatney, a reference to the popular 2015 motion picture, and made some alteration to the way the plant was taken care of including changing when to water the plant. The mission of Kelly and his team is to study the effects of a long-term stay in space. The ability to grow plants beyond Earth’s boundary is a small step toward setting up human colonies in space, Mars and other planets. Nasa announced Veggie project in 2014 to produce plants and flowers in Nasa. As you can imagine, there are a number of challenges, including pouring water, in growing anything in space. For this, the team has a special irrigation system that delivers moisture to the plant pillows from below.